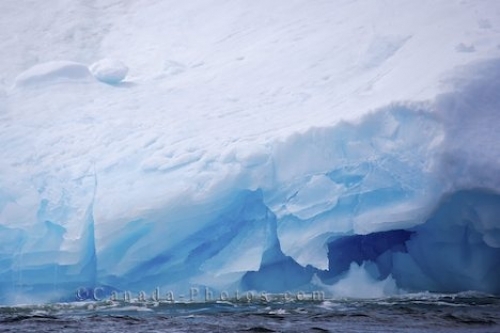 The blue color in this iceberg sparkles in the light as chunks of ice drop into the ocean that are slow disintegrating from this massive piece of ice. Small crevasses and tunnels are formed throughout the iceberg as the days become warmer around Iceberg Alley on the Great Northern Peninsula in Newfoundland, Canada. Picture of the unique color in a slow melting iceberg in Iceberg Alley on the Great Northern Peninsula in Newfoundland.